Soak up the exclusivity of this Central Lake duplex! 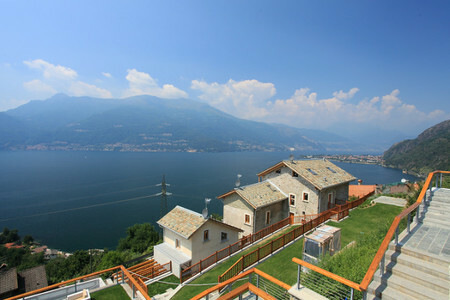 Boasting breathtaking views across the Central Lake, this flexible 1 bed duplex offers a captivating retreat within easy reach from Varenna, the Italian Alp ski slopes and all the delights of Lake Como. 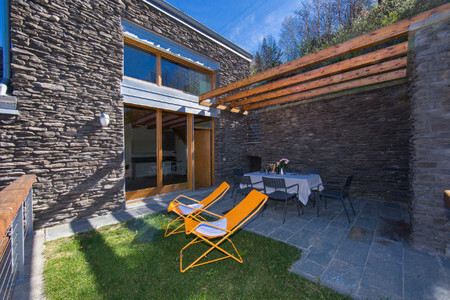 Perfect for romantic getaways as well as for versatile family stays, the duplex promises a carefree haven for holiday enjoyment; with all the comforts of a year-round home to hand, including free WIFI, air-conditioning and cosy central heating, alongside ambient beamed ceilings throughout. Within the spacious contemporary interior, guests are greeted by magnificent views which span across the residence to the Lake at the side. This scenic setting offers the perfect living room backdrop from which to enjoy a morning coffee on the stylish sofa, or with a favourite movie in the evenings to the SAT flat screen TV and DVD player. 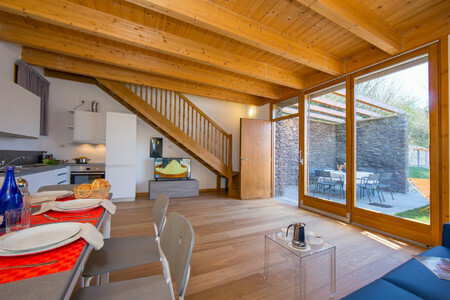 The inviting open plan living room also leads directly out to the lake view private garden with dining terrace too; for a carefree flow ideal for relaxed summertime stays. 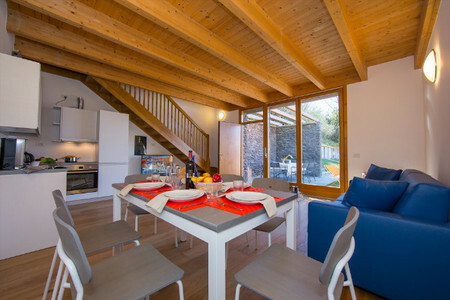 The living area is also equipped with a fully-fitted kitchen with range cooker, microwave, kettle, coffee machine, toaster, fridge and dishwasher. From the contemporary sleekness of the new kitchen diner, stairs lead upstairs to the loft-style master bedroom. Also benefitting from the same striking floor-to-ceiling views, the master bedroom offers a spectacular haven for enjoying a lazing morning slumber. With views across the residence and to the breathtaking lake beyond, the blissful backdrop offers pure escapism for honeymooners and old romantics alike. The bedroom’s views are complemented by a sumptuous double bed, alongside a chic sofa to take in the views and a useful wardrobe. Alongside the master bedroom, the duplex also offers added scope to accommodate families and groups of 4; with a comfortable double sofa bed featuring to the living room downstairs. 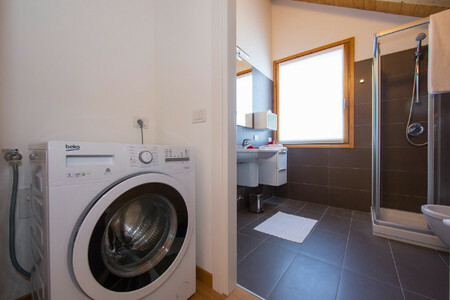 The layout of the luxury modern retreat is completed by a chic fitted bathroom with power shower, wash basin, WC, bidet and private laundry facilities. Outside, the private lake view garden offers pure holiday vibes. 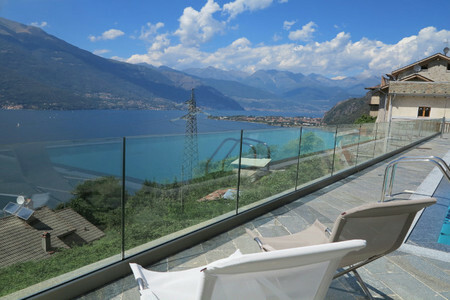 Featuring 2 easy chairs alongside a lake view dining area for 4, couples and families can fully immerse themselves in the breathtaking beauty and tranquillity of Lake Como. 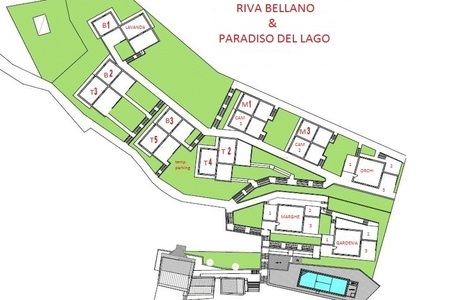 The beautiful duplex also offers the benefit of a private parking space, for easy access to the nearby amenities of Bellano and Varenna. 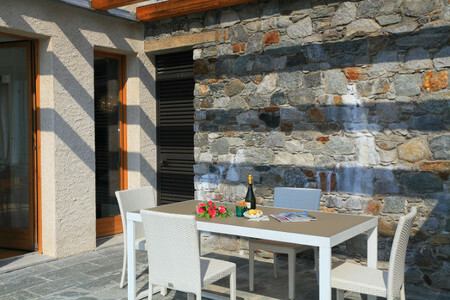 Guests are asked to note that there are a total number of 16 steps inside and 14 steps outside the property. 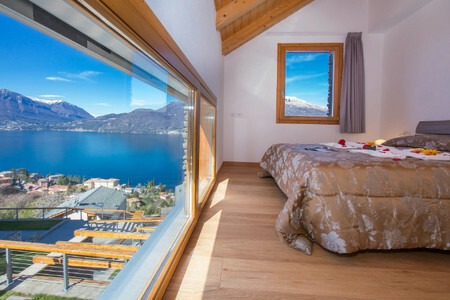 Situated within the exclusive appeal of a brand-new lake view complex, the luxury holiday home is perfectly suited for those looking to dip in and out of the tourist delights and activities of the Central Lake. With its tranquil eastern shore setting and lovely panoramic lake views to take in, the stunning hillside residence offers that carefree holiday oasis one dreams of; where you can soak up guilt-free holiday relaxation with family and friends, enjoy a dip in the communal outdoor pool (shared by 26 apartments in total), or venture out and explore the local attractions. Located just 4 minutes drive from the lakeside centre of Bellano, everything you could need to complement your self-catering stay is here; including authentic restaurants and grocery shops. 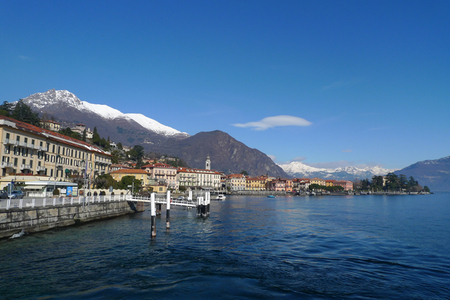 The pretty well-serviced lake town also boasts close proximity to Varenna (8 minutes drive) and offers excellent transport links; with its harbour, bus service and frequent train links to Varenna, Lecco, Milan and the north eastern shore. 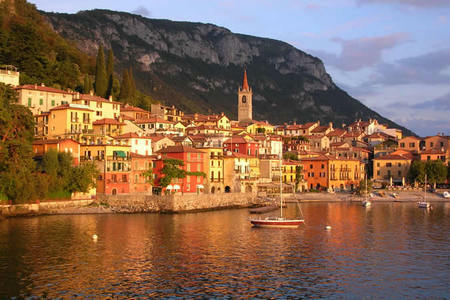 The neighbouring famous resort town of Varenna offers the perfect setting for enjoying a classic day out, with a plethora of authentic restaurants, cafes and wine bars to savour throughout the daytime and ambient evenings, alongside a lovely scenic lido for sunbathing, plenty of gift shops and a string of popular attractions to discover; from Villa Monastero and the botanical gardens of Villa Cipressi, to the Civic Museum of Ornithology and Natural Sciences. Foodies can also immerse themselves in a Ristorante II Caminetto Cookery lesson, enjoy an authentic evening aperitif or dine away in style, at one of the many romantic restaurants. 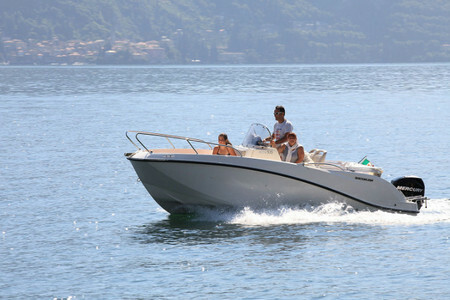 Those looking to get out on the lake can make a splash with Varenna’s power boat and kayak rental service or with a classic boat trip experience on the ‘Taxi Boat Varenna’. 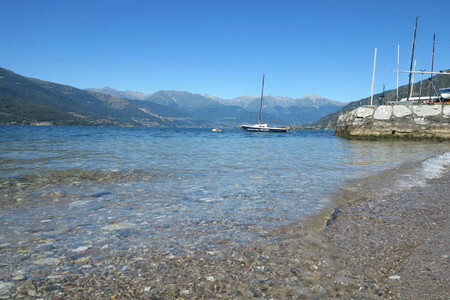 The family-friendly public lake beach at Lierna is also within easy reach from the holiday home; just 18 minutes drive away (and just 8 minutes drive south of Varenna). 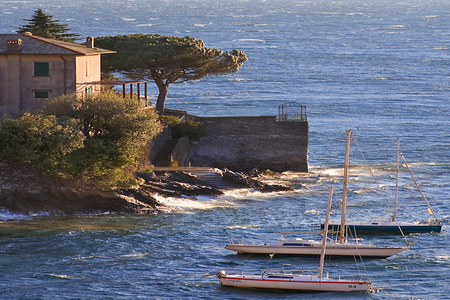 Bellano is also just 35 minutes drive from the Sailing schools and annual Regattas on offer in the historical northern resort of Gravedona. 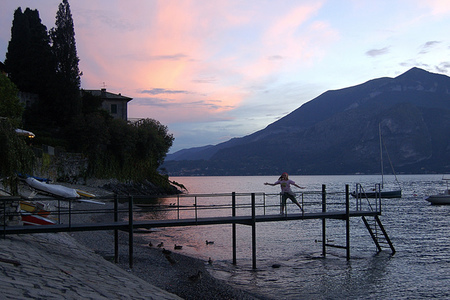 Walkers are equally well catered for; with the Sentiero del Viandante trail and Orrido di Bellano gorge walk on the doorstep in Bellano, and the hillside trek from Varenna up to the medieval Castello di Vezio serving as the perfect lake view setting for enjoying a family picnic or falconry display. 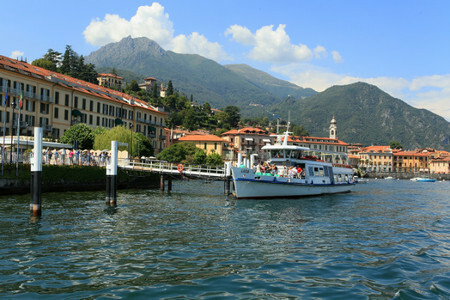 From Varenna, the frequent car and passenger ferry offers a carefree way to reach Bellagio, Menaggio and Cadenabbia. 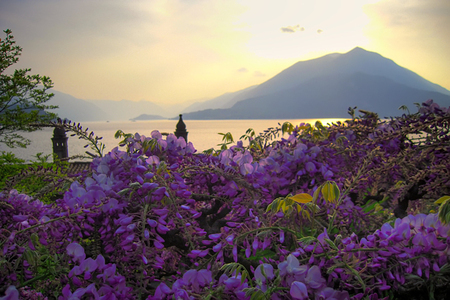 In Bellagio, visitors can enjoy immersing themselves in the wide array of gift shops, charming restaurants, Villa Melzi gardens and fashionable day-night Lido here, as well as an adrenaline-fuelled day up in the trees at the Civenna Jungle Raider Park (23 minutes drive from Bellagio), or with an extreme outdoor activity at the Bellagio Outdoor Sport Centre. 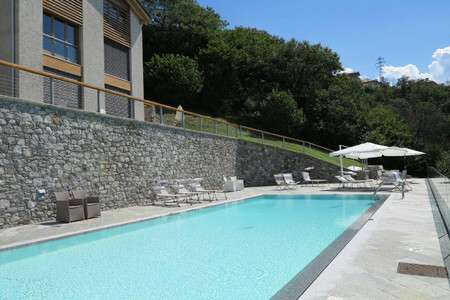 In Menaggio, the scene is set for a picturesque day of ice creams, Lido fun, mini golf, boat hire and even championship Golf; up amongst the scenic fairways of the prestigious Menaggio & Cadenabbia Golf Club (10 minutes drive from central Menaggio). 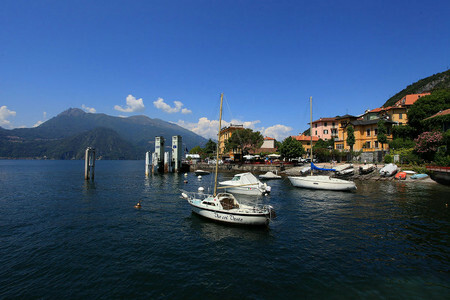 From this central western shore resort, Lake Lugano is also within easy reach for day trips, just 20 minutes bus/drive away. 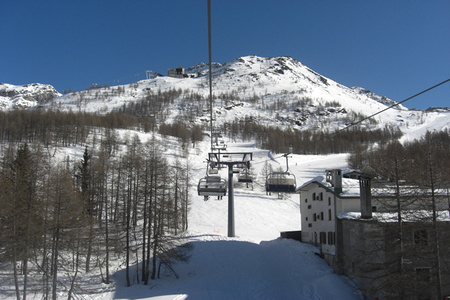 Also perfect for enjoying a wintertime break, the convenient central lake base of Bellano offers close proximity to the Italian Alp Ski resorts of Piani di Bobbio (41 minutes drive from the apartment) and Madeismo (76 minutes drive). 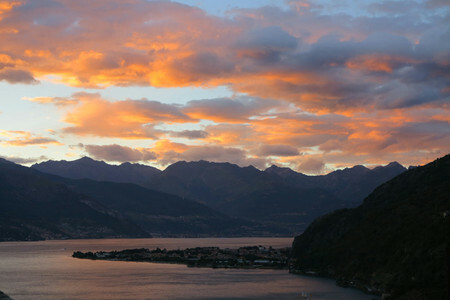 Located just 27 minutes drive from Lecco, 68 minutes drive from Como and 88 minutes drive from Milan, guests are perfectly placed for enjoying a cosmopolitan day out too! 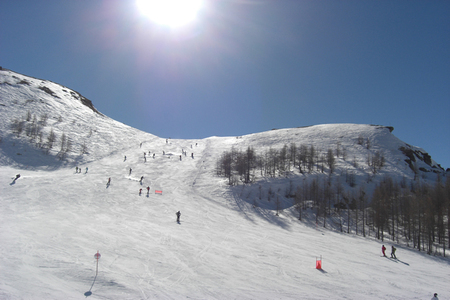 Milan Bergamo Airport is also just 76 minutes drive away – for carefree year-round travel. The additional service charge is 165.